We've come a long way since the ENIAC—that infamous, 30-ton beast of a calculator, developed in the 1940s, that paved the way for the modern computer age. One really notable thing about machines like the ENIAC was that they broke down regularly. Thankfully, modern computers built from integrated circuits are much more reliable, but they're not always so easy to fix. Laptops are a particular nuisance because they're miniaturized: all the parts are compact and jammed into a really tight space. Worse than that, some parts are made to fit only one specific machine. While the external keyboard for a desktop computer is an off-the-shelf component you can replace for a few dollars, the one on a laptop is generally made to fit only one machine (or one make of computer) and a replacement, carried out by a dealer, could cost you a quarter the price of a new machine! But don't worry, because some of the most common things that go wrong with laptops are surprisingly easy to fix all by yourself. If you're reasonably competent (and confident), and your broken machine looks like it's heading for the scrap heap anyway, why not investigate whether you can fix it yourself before you buy a new computer? Here are some simple tips based on my own experiences owning and repairing laptops over the last decade or so. Photo: Don't junk your laptop just because it develops a fault. Investigate and see how easy it is to repair. It'll save you lots of money. Make sure you use the right tools for the job, however! Photo: Take sensible precautions when you venture inside your laptop. 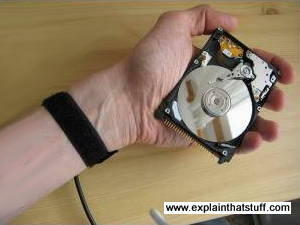 Here, I'm using an anti-static wrist strap to protect a new hard drive that I'm installing in my PC. Be sensible. If your machine is still under warranty and you're covered, get it repaired professionally at the manufacturer's expense. Remember that a laptop is an electrical appliance and tinkering inside anything electrical can be dangerous. Unless you have a basic competence with electrical things, it's best to leave repairs to someone properly qualified. Generally (but not always), laptops are powered by external transformers and use voltages of about 15–20 volts, so the risk should be small. But there are still high-voltage components inside (like the LCD screen inverter) that can give you an electric shock. Take all appropriate precautions before you start: unplug the machine completely, remove the battery as well, and maybe leave it like that for a few days to let any stray charges leak away. While the laptop may not harm you, you can easily damage it. Even if you're not clumsy and hamfisted, stray zaps of static electricity can destroy chips in a moment, so use anti-static protection. If you really don't know what you're doing, leave repairs to someone better qualified: tinkering with your broken computer could turn a minor problem into major damage and render your machine totally beyond repair. If you're determined to proceed, you do so absolutely at your own risk: don't blame me if you screw up! If your machine is still working, be sure to backup the entire hard-drive (or at least your most important documents) before you start. Copy the whole of your "My documents" (or "Documents" on a Linux machine) onto a USB flash drive or burn it onto a CD-ROM. If your computer won't boot to let you back it up, you may be able to boot it from a CD-ROM or startup floppy (remember those?) and then copy files that way. (Another handy tip: if you're familiar with Linux, you might be able to boot using a Linux live CD, mount the Windows partition, and then copy the files onto an external flash drive inside Linux.) If you're pretty sure the hard drive is intact, you may want to remove that and put it somewhere safe before you try other repairs. You'll generally be able to read the hard drive from one machine in another, though you probably won't be able to boot up from it in a different machine. One thing to note in passing is that making backups only when your computer has just crashed is a bit silly. Get into the habit of making backups regularly. Corporate IT departments usually back up their systems every night. Since I work from home, I make sure I back up the documents folder on my hard drive once a week without fail: it takes about a minute to copy the whole thing onto a USB memory stick, overwriting one of the backups from previous weeks. Try to organize your computer so the regularly changed items are in one place and quicker to copy. Backup less frequently changed things (maybe your photo or music collection) less often. Remember you can use things like MP3 players to store computer files as well as music, so you can use those as handy portable backups if you need to. Another good tip is to keep an offsite backup somewhere. Keep a copy of your home computer's documents folder on a USB drive in your desk at work, for example. Then you're better protected against things like fire and theft. There are also plenty of secure, inexpensive cloud-based storage systems (such as Amazon's S3, Google Drive, and Apple iCloud) that you can use to backup your files online. 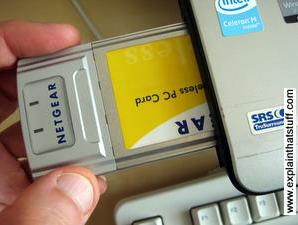 Photo: Plugin PCMCIA cards offer a good, simple solution to some of the most common laptop failures. This is a plugin wireless card; you can also get plugin USB cards, dialup modems, memory cards, and lots more. Virtually every modern laptop has several USB sockets and it's easy to plug in an external keyboard, mouse, screen, webcam, hard drive, and so on. Most laptops also have a PCMCIA card socket (a thin slot on one side) where you can plug in an external modem, Wi-Fi card, or USB hub. If something obvious breaks on your laptop, the simplest, cheapest, and easiest "repair" you can make is often to switch to an external device. So, for example, if your keyboard breaks, you can use a plugin USB keyboard. If your sound card packs up, get yourself something like a Griffin iMic (a little external sound card that plugs into your USB port). If the modem stops working, use a plugin modem card in the PCMCIA port. If one of your USB sockets stops working, get a plugin USB hub and use that in one of the other USB sockets instead; if all your USB sockets fail, get a PCMCIA USB hub. You can usually buy these sorts of addon "peripherals" for a few dollars on eBay and you can fit them in seconds, yourself, without tinkering inside your computer or worrying about making things worse. Job done! 3. Know your "service flaps"
Understandably enough, most laptop users spend all their time looking at the keyboard and the screen. But if you spend a moment looking at the underside of your machine, you'll find there are maybe half-a-dozen little plastic flaps, secured with one or two screw or slide clips, giving access to the components most likely to go wrong and need replacing. Generally, you can remove the battery, the hard drive, and add extra memory, and you may also be able to replace the CPU fan—all without going into the innards of the machine. 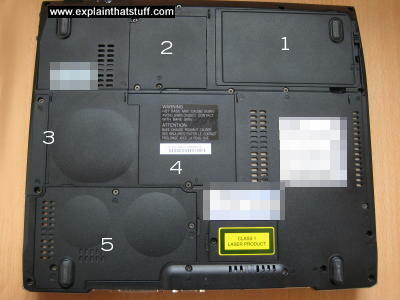 Photo: This laptop has five small flaps underneath giving easy access to the main components by lifting only a couple of screws. It varies from machine to machine, but on this one: 1 is the battery; 2 is for memory expansion; 3 is the hard drive; 4 is the LAN card; 5 is the CPU fan and CPU. A few years ago, when I crashed the hard-drive on my nearly new laptop, I took it into a dealer for a very expensive repair, which would have involved unplugging the broken drive and swapping it for a completely new one and probably took about a minute. Shortly afterward, I discovered I could have done the same job myself by removing a couple of screws on the base of my machine. It would have been easy to look up the part number on Google or eBay and order myself a new drive at a fraction the price I was charged. Take a few moments to look through the manual that came with your machine. Find out what flaps it has underneath and what you can easily gain access to and repair. Some parts of your machine won't be accessible through service flaps—and it's usually far from obvious how to get deeper into a laptop if the bit you want to replace isn't in sight. Once you start removing the main case screws, everything gets more tricky: if you take the wrong screws out, you can quickly find the machine falling apart in your hands! Some laptops have snap-off plastic covers (quite common with the screen surround, which you can usually snap off after removing a couple of screws hidden under circular plastic covers at the top and bottom). Others have snap-off covers over the power switches and around the keyboards. If you look closely, you can often see little recesses where a screwdriver can be inserted. But if you get it wrong and push or pull in the wrong place, you'll snap the plastic and damage it horribly. Before you start wrecking your machine, search for online videos or repair sites that show you exactly how to get inside and access the part you want to replace. Bear in mind that some manufacturers (Apple in particular) go to very great lengths to prevent you repairing their devices, obliging you to buy new ones, and some devices are just difficult or impossible to repair. Sony ebook readers, for example, have extremely fragile screens that are bordering on impossible to remove; even their batteries are firmly glued inside and difficult to replace. Nevertheless, you might still find a handy video on YouTube explaining how to do exactly the repair you need (always check first to see if someone has blazed a trail you can follow! )—and that can make all the difference. If your gadget is completely broken, you've nothing (but time) to lose by having a go—and you may well find it a very educational experience, even if you end up with a load of broken junk that's entirely beyond repair (I got a fascinating insight into how touchscreens work by taking my ebook reader apart, for example, though all I had to show for my "repair" was a pile of broken glass, metal, and plastic). If your computer's problem isn't obvious, try Googling the symptoms. That's how I discovered the LCD screen inverter needed replacing on one of my old laptops: the screen was flickering and occasionally going dark, but I could still see what was written on it very clearly. Having learned about the risks of replacing an inverter (it's a high-voltage component), I took appropriate precautions, then removed a couple of screws on the bottom of my laptop's screen and ventured inside. It was easy and cheap to order a new part from eBay and I fitted a replacement in about thirty seconds. I was amazed and delighted that I'd turned a useless machine, destined for the garbage dump, into something as good as new with virtually zero effort. And the repaired machine is still working well almost 10 years later. Once you know what's wrong with your computer, you'll generally need to replace one or more parts. Locating the right part is half the battle when you're making repairs. Assuming you can get at them, fitting spares is often much easier than it sounds. The parts most likely to go wrong are the ones under the little flaps on the base of your machine. Simply read off the part number and type it into Google and eBay and see what you find. Often, you'll find an official replacement from the manufacturer and maybe cheaper equivalents made by other companies. You'll find secondhand bits recovered from broken laptops on eBay. There are also lots of broken laptops for sale on eBay and it may be cheaper to buy a "spares and repair" version of your exact machine and salvage appropriate parts than to worry about finding one specific part. Then you'll have other spare bits ready for future failures as well. Photo: Some manufacturers make it deliberately difficult to open up their devices for repair because they want you to buy yet another new one. Even so, a bit of online research is usually all you need to get inside. 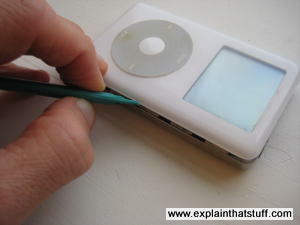 With the right plastic tool, opening up an iPod Classic is relatively simple and does no damage at all. The main parts of a laptop are usually modular and designed to be replaced. Things like a laptop keyboard, for example, simply plug into the motherboard (the main circuit board) with a little clip you can remove yourself; they're not soldered in place. That doesn't mean computer parts are robust: often they're easily damaged and can't withstand hamfisted repairs. Even if you handle them carefully, some parts (memory chips, for example) are susceptible to damage from static electricity. Google around before you fit a new part and read up on any special precautions you need to take. Don't be in a rush; your computer's not going anywhere. Broken "mechanical" parts of your laptop are a bit harder to replace and do require a bit of dexterity and technical skill. For example, laptops that are opened and closed repeatedly will eventually suffer from broken hinges. Replacing parts like that can be tricky: often you'll need to remove quite a lot of screws and other decorative parts and there is a bit of scope for damaging your machine in the process. Go slowly, be patient, and take close-up photos at each stage so you know exactly where everything went; that makes it easy to put it all back again later. 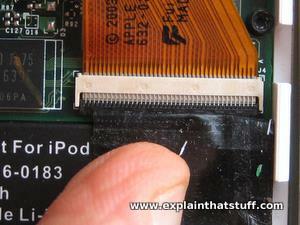 Photo: This iPod circuit board uses flexible flat ribbon cables to link together its various modular components. The connections are easy to remove, but you typically need to lift a flap before you can do it or you'll snap them. Learn how to open and close one properly before you make a start! 7. How will it fail? Although manufacturers probably don't design their machines to wear out (computers make themselves obsolete after a few years whether you use them or not), laptops certainly don't seem as well built as they were about a decade ago. Failures are more likely now computers are being used by a wider, less experienced group of people. It's worth anticipating when and how your new machine is likely to go wrong—and taking a bit more care to stop that happening. 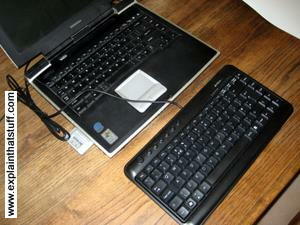 Photo: Laptop keyboards will not withstand years of constant pounding. Why not assume your keyboard is going to break and use an external keyboard from the start? If you look through the broken machines for sale on eBay, you'll find a few other common causes of laptop mortality. Liquid damage is high up the list. Spill a cup of coffee on a laptop and you can be reasonably confident it won't work again, so get into the habit of drinking away from the machine. Broken USB sockets are also reasonably common, usually caused by people trying to force plugs in the wrong way around. USB connectors are inherently robust—they're meant to be "plug and play"—but that doesn't mean they're indestructible. Bear in mind that the sockets you plug your peripherals into are soldered (sometimes not that well) directly onto a circuit board in your machine and if you press them too hard, too often, you can break the connections. So treat your laptop with a bit of care and respect and it'll repay you with years of faithful service. I have a Toshiba dating from 1996 that stills works fine; I'd still be using the ENIAC if it would only run Firefox. The Restart Project: Encouraging and empowering people to repair things instead of throwing them away. Repair Cafe: A world-wide network of community repair enthusiasts. iFixit: A community-style website where people share their repair tips. 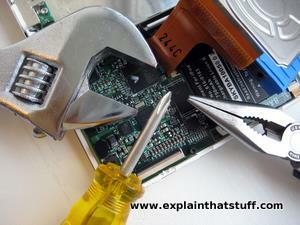 Laptop Repair 101: All kinds of repairs, simply described. Troubleshooting and Maintaining Your PC All-in-One For Dummies by Dan Gookin. Dummies, 2017. A clear and simple guide to fixing common PC issues that will also help you understand how your computer really works. Build Your Own Computer by Gary Marshall. Haynes, 2012. A basic guide to building or repairing a PC. Build Your PC for Dummies by Mark L. Chambers. Dummies, 2009. Another useful self-build guide. PC Repair and Maintenance by Joel Rosenthal and Kevin Irwin. Cengage, 2003. A practical guide to installing, troubleshooting, and repairing hardware. The Complete PC Repair and Troubleshooting Lab Guide by Donald Casper. Pearson Education, 2003. A practical guide to installing, troubleshooting, and repairing hardware. At Repair Cafes, 'Beloved but Broken' Possessions Find New Life by Christopher Mele. January 18, 2017. How Repair Cafes have spread from Amsterdam and around the world. The repair parties for broken appliances: BBC News, 18 February 2014. Why not get together with friends to fix your broken gadgets? 'Mountains' of e-waste threaten developing world: BBC News, 22 February 2010. Where does your laptop go when you send toss it in the trash? Maybe it becomes a pollution problem in a developing country? London's illegal trade in electronic E-waste: BBC News, 8 March 2010. People in London, England dump more than 4,000 old TVs a day. That's just one city in the world! Make do and mend? No thank you by Zoe Kleinman: BBC News, 13 October 2009. How to figure out if a broken gadget is worth repairing. Q & A: Weighing a Heavy Laptop Repair by J.D. Biersdorfer. The New York Times, February 18, 2009. More advice on assessing whether your computer is worth a repair.